Last night, Darth Vader came down from planet Vulcan and told me that if you don't watch these videos, he'd melt my brain. I, uh…you’d better, uh…hey you, get your damn hands…on…these videos! …I’m sorry. We usually have Nikola write these posts, but we couldn’t this time, because the last set of beatings didn’t take he wasn’t there for the recording. Instead, you’ve got: Paul Franzen! Michael Gray! And Nathaniel Hoover! 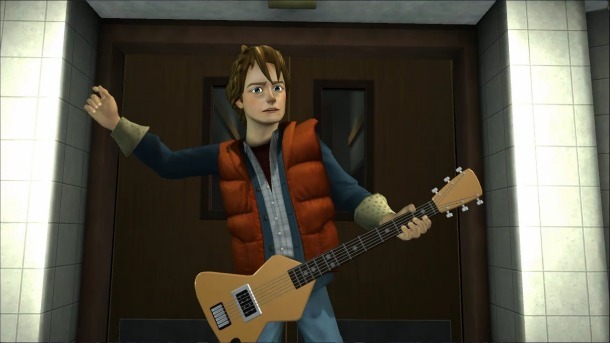 All providing a video “talkthrough” of Back to the Future: The Game – Episode 4: Double Visions, for the personal home computer. Watch it for the wit, charm, and helpfulness of our three co-commentators, but more importantly, watch it for the exclusive announcement of a brand-new spin-off to the Ace Attorney series! Nice to see I’m still the running gag here at GameCola. I saw the first movie last week, actually. In the same weekend I also watched Teen Wolf. Move aside Fox McCloud, Michael J. Fox is my new favorite Fox. Now it’s on to the next two! @Matt Jonas You’ll be late to the MARTY if you don’t see them soon! Hahahaha, very funny. It’s a pun, and puns are funny. You guys are very punny! Okay now you got me started with the puns! I am really enjoying the commentary and I wish you the best as you get ready to wrap up the game! Part 5 is recorded! Hopefully we’ll be getting it up within the week.